I am not a football fan, personally, but I have always believed that the fans in the Hillsborough disaster were innocent. For those who are not familiar with what happened, on 15 April 1989, there was a huge crush at the football stadium where Liverpool fans had gathered to watch their team in the semi-finals of the FA Cup. Due to fears of football hooligans, the spectator areas were arranged in pens. In part because of the poor way that these had been constructed, and in part because of overcrowding, one of these pens collapsed and 96 people were killed. I will never forget the time I was at Paddington Station in London, trying to get back to Bristol, and there had been a football match. Barriers were set up all along the platform, and the fans (and me) were herded along the platform, and had to queue for ages to get on the train. They were apparently used to this sort of treatment and responded with good humoured banter to the whole thing. I had not experienced this corralling before, and found it extremely frustrating, claustrophobic, and potentially panic-inducing. I was only calmed down by the good-natured chat of the football fans. At the time of the Hillsborough disaster, police and politicians tried to pin the blame on the fans – but now, after the third judicial inquiry into what happened, it has been ruled that the fans were unlawfully killed. Today, after 27 long years, the 96 victims of the Hillsborough tragedy – and their families – have finally received justice. The youngest victim was just 10, Jon-Paul Gilhooley, and the oldest was 67 years old, Gerard Bernard Patrick Baron. These were fans that went to a football match, as so many of us do, on the 15th April 1989, but never returned to their loved ones. I pay tribute to the families and friends of all the victims of the tragedy – as well as many others from the city of Liverpool – for the passionate and dignified campaign they have fought for almost three decades. Today they received total vindication for their fight for the truth and for justice. But what does all this tell us about the state of British society? In my opinion, it tells us that the ruling classes want to create a caricature of working class people as an unruly mob of workshy slobs who eat terrible food and behave badly at football matches. The authorities also made efforts to conceal the truth about what actually happened. The ruling classes fear the solidarity and organisation of the working classes, and have done their best to destroy it by undermining or destroying the power of the unions, and removing every social measure that creates an even playing-field for the less-well-off. Council houses were sold off, utilities privatised, and now they are trying to destroy the NHS. However, perhaps this victory for the Hillsborough families means that the tide is turning. I hope so. It also tells us that you don’t get justice without struggling for it, campaigning for it, and organising together in solidarity to get it. It tells us that the families of the victims of the Hillsborough disaster pulled together, through thick and thin, for 27 years to get their victory. As the Liverpool football anthem has it, “You’ll never walk alone”. 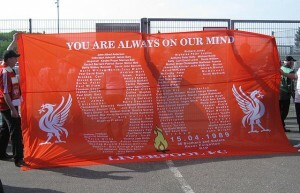 Liverpool fans unfurl a banner displaying the names of the deceased on the twentieth anniversary of the disaster. Photo by Linksfuss – Own work, CC BY-SA 3.0. That is why posthumous reputation is so important. Now that the Hillsborough victims’ good names are restored, perhaps they can rest a little easier. These victories (small or great) for social justice are won by real people getting together in solidarity, setting aside their differences, to campaign for truth and justice. Yes, we must change ourselves, but we can and will change the world by working together. We cannot sit idly by, arguing about how many gods can dance on the head of a pin, in the face of climate change and social injustice and environmental destruction. My theological musings tend to be of a mostly practical nature: how to put our values into practice, and how our theology underpins the struggle for social justice. I chose my values (of democracy, fairness, justice, equality for all, environmentalism) on the basis that all life is sacred. The gods I am in relationship with also seem to share these values – otherwise I wouldn’t be in relationship with them.